I am getting a jump on Valentines this year. AND by a jump...I mean so far I have 1 out of 3 Little Men's done. That is a "jump" right? I sure hope so. I got this idea when I was actually brainstorming a thank you gift idea. I am excited to show you that version later. Once I had the original idea, it just kind of morphed into a possible valentine idea. 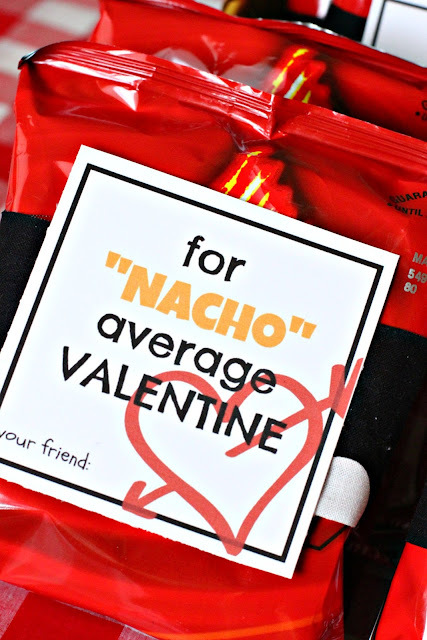 Sometimes I have a hard time thinking up valentine ideas that my boys want to give out. They aren't so much about the lovey-dovey, mushy, all hearts and kisses stuff. Imagine that. Shocking that little boys wouldn't so much be into that! Last year I only had one Little Man to make valentine's for and I made my How Does a Dinosaur Say Happy Valentine's Day? valentines. They were a big hit. Fast forward to this year and I have not one, but three Little Men to make valentines for, thanks to starting kindergarten and preschool. 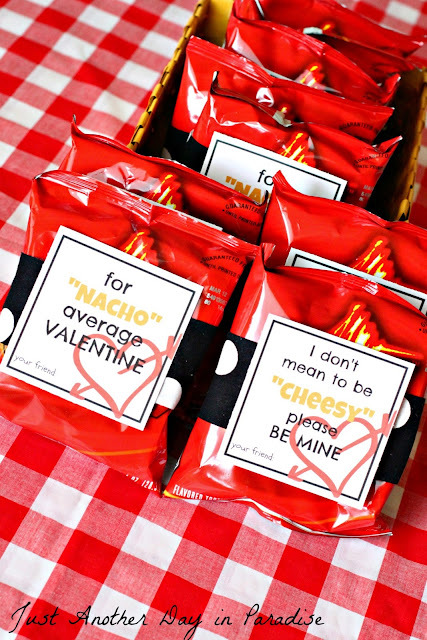 I was pretty happy with myself when I came up with these phrases that would fit perfectly with snack-sized bags of Doritos chips. 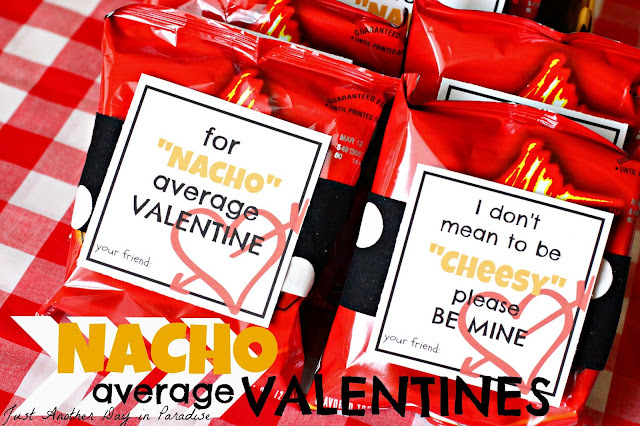 The "NACHO" average valentine was the first phrase I thought of. I wanted to play on the cheesiness of the chips too. I made these tags in my go-to editing program PicMonkey. 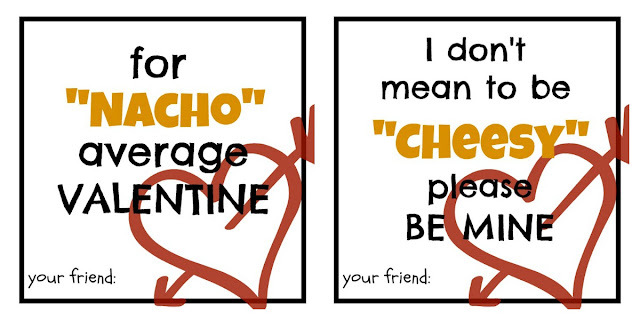 I the tags on a single sheet and made it a downloadable/printable pdf file, in plenty of time for you to make some of these for your little Valentine to give out. Making them is easy peasy. Simply download the tags. Then print off as many as you need. By some snack-sized bags of Doritos (or any other nacho cheese tortilla chips). Cut out the tags. Have your little Valentine sign the tags. Then I cut out some black and white fabric. I very simply taped the fabric strip around the bag and then taped the tag onto the front of the bag, covering the seam of the fabric I taped down. 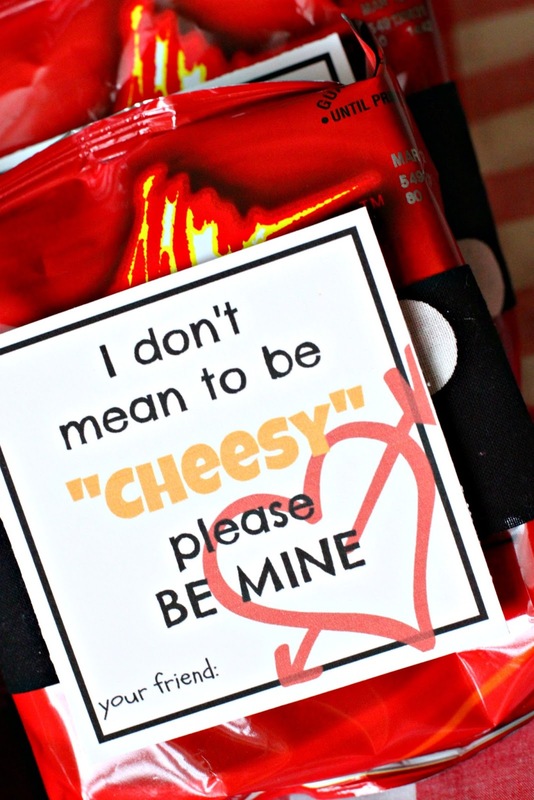 Before I knew it I had a whole slew of "Cheesy" valentines all ready for Middle to use in his class on Valentine's day. He is pretty excited! Now I just need to decided what I am doing for the other two. What are you guys doing this year for valentine's? What have you done in the past? What a clever idea, I'm sure these will be such a hit at school! I've done these: http://spoonful.com/crafts/rock-candy for the past couple of years for my firsties using Hershey Kisses instead of pb cups. Can't wait to see what else you come up with! Thanks for the link Corrie. Melissa, what boy doesn't love Doritos?! Hahaha. Oh my gosh--These are hilarious. I love them. These are way too cute and perfect! I love corny and cheesy saying like this! 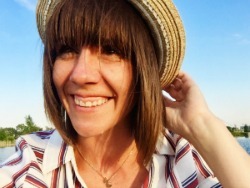 Thanks for sharing over at Finding the Pretty & Delicious Linky Party. Hope you'll join in again on Saturday.